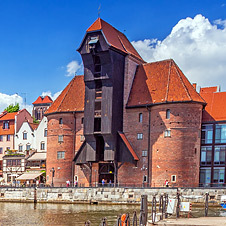 Gdańsk is the capital of the Polish seaside with a population of almost 500,000, making it a major center of economic, scientific and cultural life in Poland, as well as a highly popular tourist destination. Gdańsk is a thousand-year-old Hanseatic city, located on the southern edge of Gdańsk Bay of the Baltic Sea. This is quite new point on the stag and hen party map in Poland. There is a lot to discover in Gdańsk – charming streets, historic interiors, seaside lidos, sailing trails, comfortable hotels, elegant restaurants, cozy cafés, popular clubs, pubs and discos. Amber processing is an important part of the local economy. Here, people are still cultivating centuries-old traditions of amber processing, which is why Gdańsk has become the amber capital of the world. It is enough to say that the whole of Old Gdańsk is a historic monument. You should definitely take a stroll along Long Lane and Long Market where there are many buildings and tenement houses which used to belong to the wealthiest citizens of Gdańsk – the Ferber House, the Czirenberg-Freder Tenement House or the Lion’s Castle are just some of the historic buildings. At the end of Long Lane we will enter Long Market, which used to be the main square of Gdańsk. We will see the Main Town Hall and the Artus Court, rest at the Neptune’s Fountain and go through the Green Gate while observing some of the historic tenement houses along the way. The offer of Gdansk is original and unusual if we compare other cities: sailing, parasailing, jet skiing, deep sea fishing, but also “regular” acitivities such as paintball, target shooting, 4×4 driving, go-karting and quads and many more. Gdańsk makes each and every visitor feel at home. Make your stag party in Gdansk even more exciting! We also recommend Kraków and Wroclaw for your stag do.